In a nod to both a popular Marvel character and ancestry, Pierre-Emerick Aubameyang delivered a celebration worth celebrating Thursday. The Arsenal striker scored twice as his side eliminated Rennes 3-0 in the Europa League, the continent’s second-tier international club competition behind the Champions League. 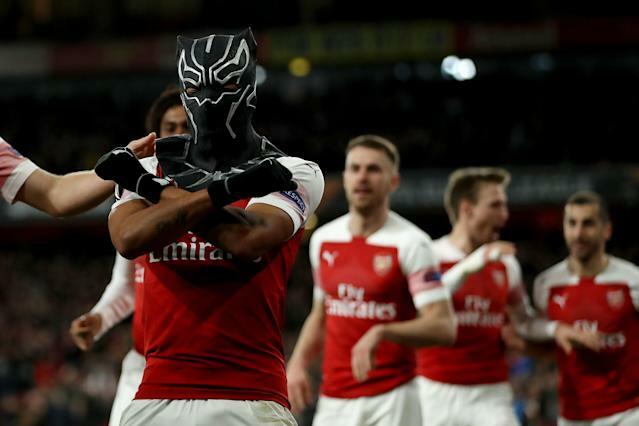 The celebration coincides with the release of the Black Panther-less Avengers: Endgame trailer – if you want to know why he’s not in it, go see Infinity War – and it also honors Aubameyang’s bloodlines. Born in France, Aubameyang is the son of former Gabon captain Pierre. The Gabonese national team’s nickname is “Les Panthères” and the federation’s badge is literally a black panther. 📣 "Arsenal fans... Wakanda Forever! You already know!" Gabon has never been to the World Cup, nor has it ever been past the quarterfinals of the Africa Cup of Nations. Aubameyang is the country’s all-time leading scorer, and unquestionably its greatest player ever. As of Thursday, he’s now the author of its greatest goal celebration ever, too.